With reports of daffodils in December and the warmest winter on record, it looks like spring has sprung much earlier than expected in 2016. It’s not just the local flora that has been confused by the unseasonably warm conditions, as last week, eight tiny ducklings were picked up in Emsworth, Hampshire, having hatched some four months earlier than expected. These adorable little ‘early birds’, thought to be just a few days old when found, were rescued from the roadside after their mother and three siblings were tragically struck by a car and killed. They were taken to Arthur Lodge Veterinary Surgery in Horsham, who contacted Tarnya Knight, a local wildlife carer, who works for the Born Free Foundation. 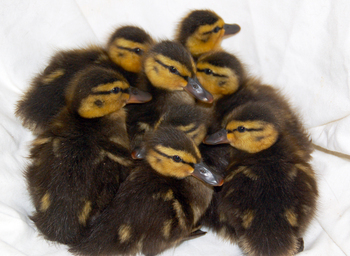 The eight ducklings have affectionately been nicknamed: Mike, Carol, Alice, Greg, Marcia, Peter, Jan, Bobby and Cindy, after the nine members of the ‘Brady Bunch’ family.